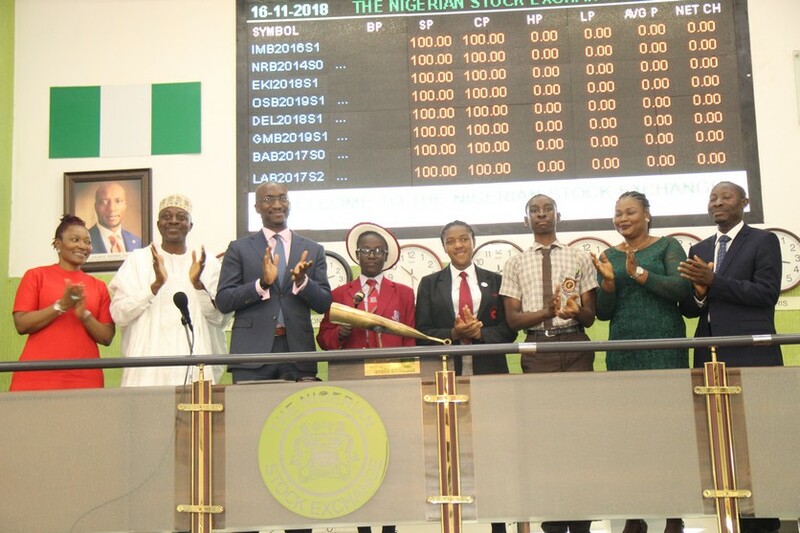 A student of Good Shepherd School, Ajegunle Village, Atan-Ota, Ogun State, Miss Lawrence Deborah, has emerged overall winner of the 2018 edition of the Nigerian Stock Exchange Annual Essay Competition for students in Senior Secondary Schools in the country. Deborah clinched the first position ahead of over 20,150 participants across the country, winning N500,000 scholarship fund for her university education, N250,000 equity investment, and a laptop, with her school also rewarded with a trophy, three desktop computers, and a printer. Also, Miss Ashiru Oluwalanoayo of Corona Secondary School, Agbara, Ogun State and Master Dominic Charles of GEC Comprehensive College, Ipaja, Lagos State, emerged first and second runners-up respectively. Each of them also got a laptop, equity investment and scholarships toward their university education; their schools got a varying number of computers and trophies. Seven laptops were given as consolation prizes to seven other winners. The winners were announced during an awards ceremony at the Civic Center, Ozumba Mbadiwe Road, Victoria Island, Lagos, on Friday, November 16, 2018. Speaking at the function, Chief Executive Officer of NSE, Mr Oscar Onyema, in his address delivered by Mr Bola Adeeko, Head of Shared Services at the NSE, noted that the goal of the competition was to get future leaders to think about how to adopt technology as a veritable tool for building a financially savvy generation. “It is my belief that this topic will sow the seeds that will prepare this generation for the Fourth Industrial Revolution,” he said. In her keynote address, Ogun State First Lady, Mrs Olufunso Amosun, represented by Mrs Yemisi Durojaye, commended the NSE for this initiative which seeks to bridge the gap between classroom learning and practical knowledge required for long-term personal financial responsibility for societal development. “It is also heart-warming to note that over 40,000 young people in more than 8,000 secondary schools across Nigeria have benefited from this competition,” Mrs Amosun stated.